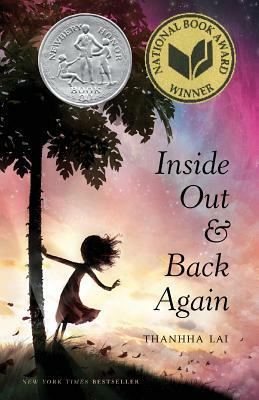 Inside Out and Back Again (Large Print / Paperback) | Let's Play Books! Inspired by the author's childhood experience as a refugee--fleeing Vietnam after the Fall of Saigon and immigrating to Alabama--this coming-of-age debut novel told in verse has been celebrated for its touching child's-eye view of family and immigration. H has only ever known Saigon: the thrills of its markets, the joy of its traditions, and the warmth of her friends close by. But now the Vietnam War has reached her home. H and her family are forced to flee as Saigon falls, and they board a ship headed toward hope--toward America. This moving story of one girl's year of change, dreams, grief, and healing received four starred reviews, including one from Kirkus which proclaimed it enlightening, poignant, and unexpectedly funny.